Ever since we lived in Vancouver, Crystal and I have enjoyed our walking. So our peaceful two mile trek to town and back in Durham is a happy part of English life. We decided it would be nice to keep up the momentum while visiting Crystal's family here in Texas. But the walk along the road didn't turn out to be completely benign either, as we had several dogs (both individuals and small packs) come charging at us to defend their property from such interlopers. How does one tell if a running, barking, charging parcel of muscle and teeth will turn into a tongue-lolling cutie upon arrival or a flesh-tearing fiend? I began to have second thoughts about leaving the pistol behind and wondered about the plausability of a self-defense plea. All turned out well and we were none the worse for wear upon our return except for the dust on our shoes. I had another "you're not in England" moment when we returned home one evening to Crystal's folks' and remarked that we hadn't left the porch light on. As a matter of fact, the high winds had knocked down a number of power lines so we all gathered in the living room of their log home with the Coleman lantern hanging from the heavy wooden cross beam. Crystal's dad came in from the back with a plate of steaming vittles, "Who wants some charcoal grilled Spam®?" But I declined, preferring to savor the memory of the venison from nephew Russell's first deer and to hold out for some Texas delicacy from that feral hog that cousin Robert bagged the following day (not to be outdone by his younger brother). But even in Texas the Thanksgiving dinner is as traditional as anywhere else in America! We had a delicious time at Aunt Reba and Uncle Bob's with Ellie garnering lots of admirers in her new dress. 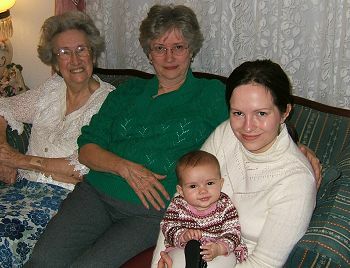 It was particularly memorable to get a four generation picture (Granny Hunter, Nana Zaidle, Mummy Crystal and Ellie).